When entering hostile situations, versatile force is needed. 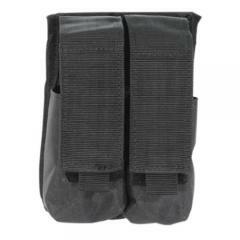 Voodoo Tactical's M18 Smoke Grenade Pouch offers a convenient carry solution. Designed specifically for tactical and law enforcement operatives, the carrier features two individual pockets for standard M18 smoke grenades. Internal, spoon guides maintain an upright position of the grenade for easy retrieval and prevention of improper installation. A hook-n-loop retention flap provides secure retention, ensuring grenades stay with the user throughout vigorous physical activity. Built for maximum durability, the pouch is constructed from military-grade nylon with reinforced seams to guarantee long-lasting duty life. The universal strap backing allows for secure attachment to duty vests, belts, tactical outerwear and other web platforms.